This is a clump forming succulent that develops a series of small tower like growths. It looks a little like a cactus, however it does not have spines. A mid green and heavily ribbed it is a plant that looks good as a single specimen, however we think it is better when it sends out enough offsets to form a small colony. Best grown in a container so you can make sure it stays dry over winter when it is dormant. 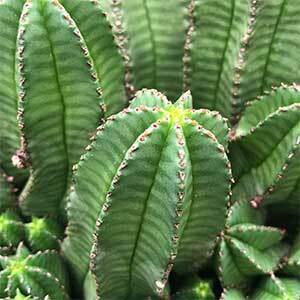 You could grow Euphorbia anoplia outdoors in the right climate, you need a dry winter and defiantly no freezes. Use a specialist succulent and cactus potting mix to ensure that the drainage is perfect. It does look good in a small terracotta pot. Watering is only requires during the active growing season which is from late spring through summer. In winter, generally no water is required. As with all Euphorbias, the plant had a milky sap which which is an irritant to skin and eyes, protective clothing and eyewear should be worn when handling. Spread – To around 30 cm over time. Flowers – Small red flowers. Foliage – Mid green, heavily ribbed in the form of columns and spineless. Frost tolerant – No, frosts can scar and mark the foliage, heavy frosts can kill the plant.